After putting the garden back to rights yesterday after all the recent windy and rainy weather, and given that we were in for another very hot and sunny day, neither of us felt like doing anything more strenuous than having a quiet countryside walk which didn’t involve a very early start and driving any great distance. 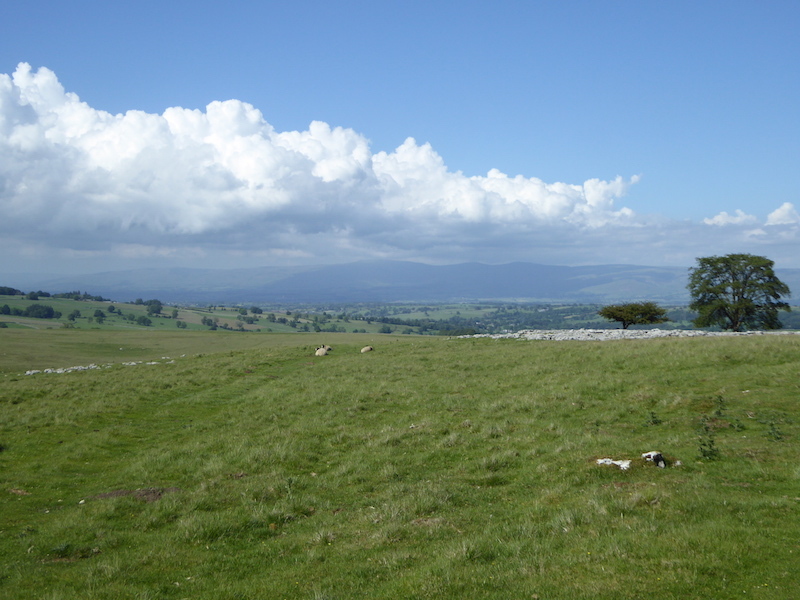 With all that in mind we opted for a walk over Crosby Ravensworth fell so, after an early lunch, off we went. 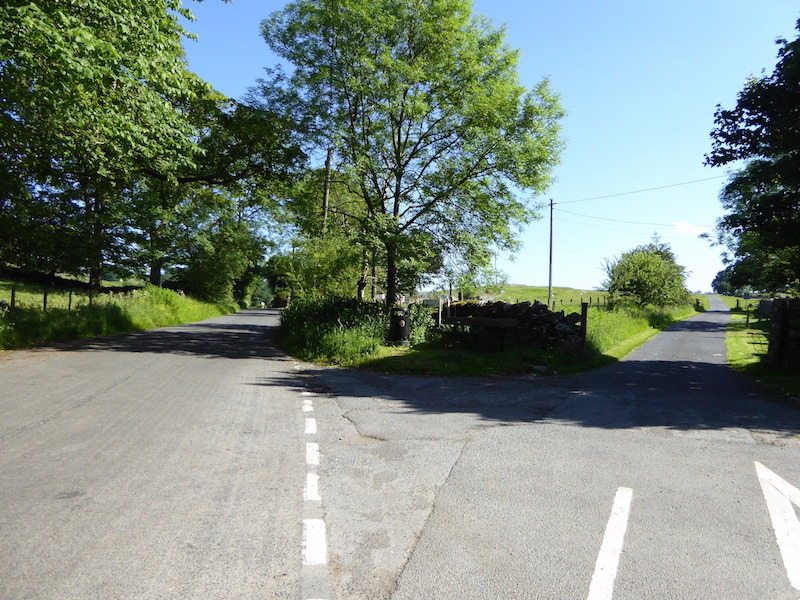 As Crosby Ravensworth is a quiet little village, and somewhat off the beaten track, we expected not to have any problems parking when we got there. 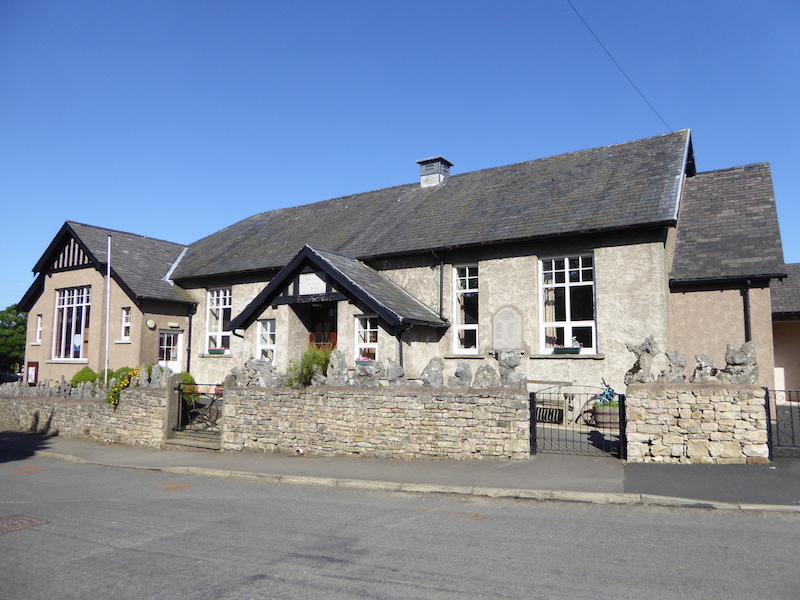 Well, our best laid plans had definitely gone a’gley when we arrived as there was a bit of a Sunday lunch ‘do’ on at the village hall and the place was chock-a-block with cars and their occupants piling in for their meal. 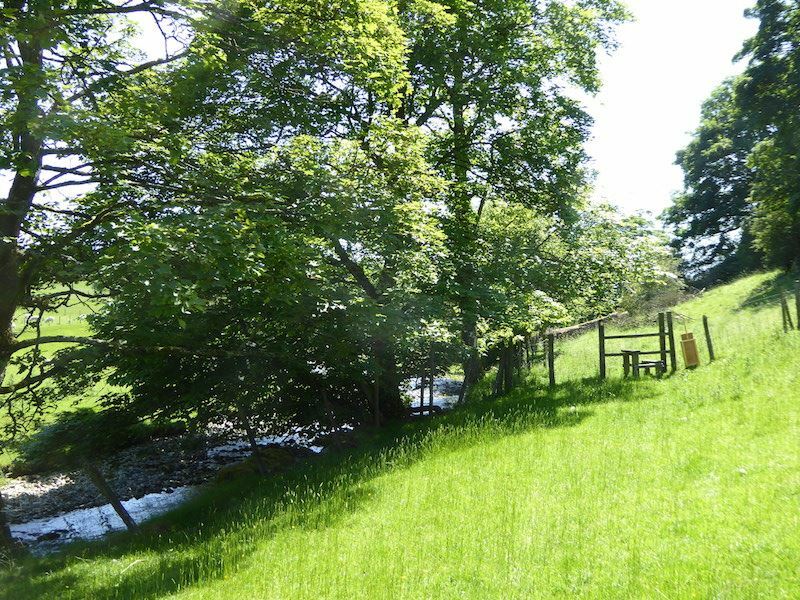 We spotted a gap at the end of the roadside parking alongside the beck and, after a bit of shuffling just managed to squeeze ourselves in. Trust us to visit a normally quiet village on one of its busier days! Having squeezed ourselves in I wandered a few paces down the grassy verge alongside the Lyvennet Beck for this view of St Lawrence’s Church and the bridge across the beck. 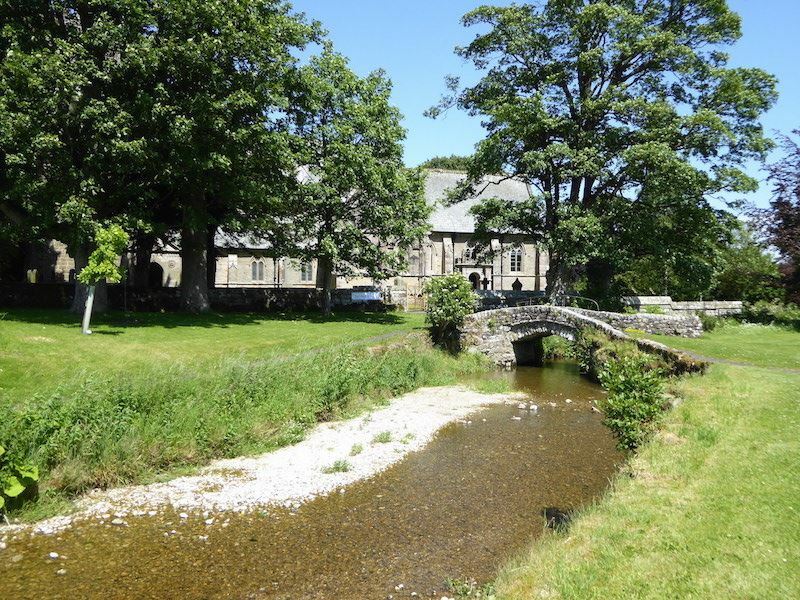 The ford across the beck with the church in the trees just beyond. 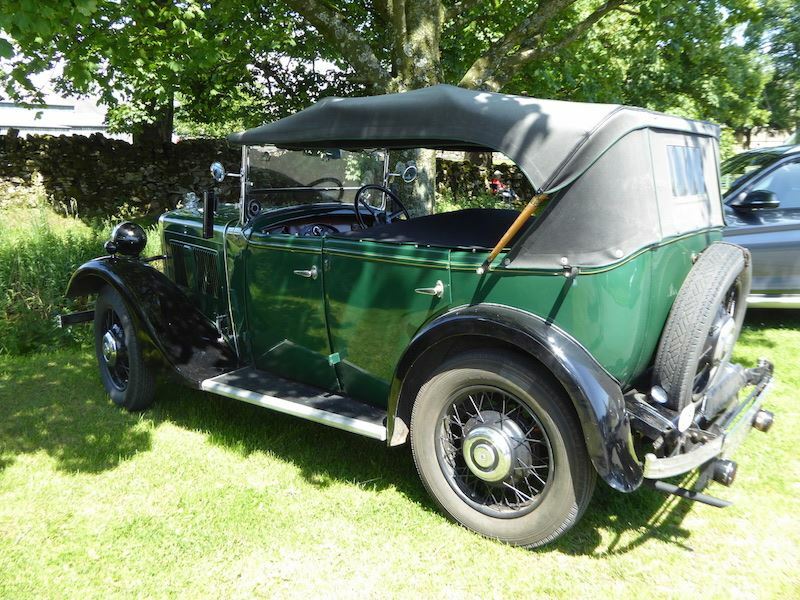 A vintage Morris parked up alongside the beck, whose owner was no doubt tucking into his Sunday lunch in the village hall across the road behind me. 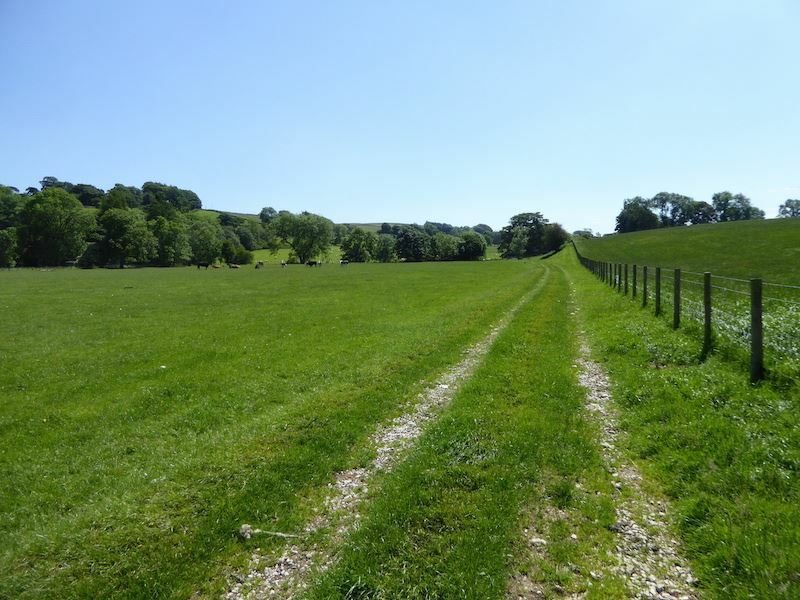 We walked just a few yards away from the village hall and passed through the field gate onto this track. 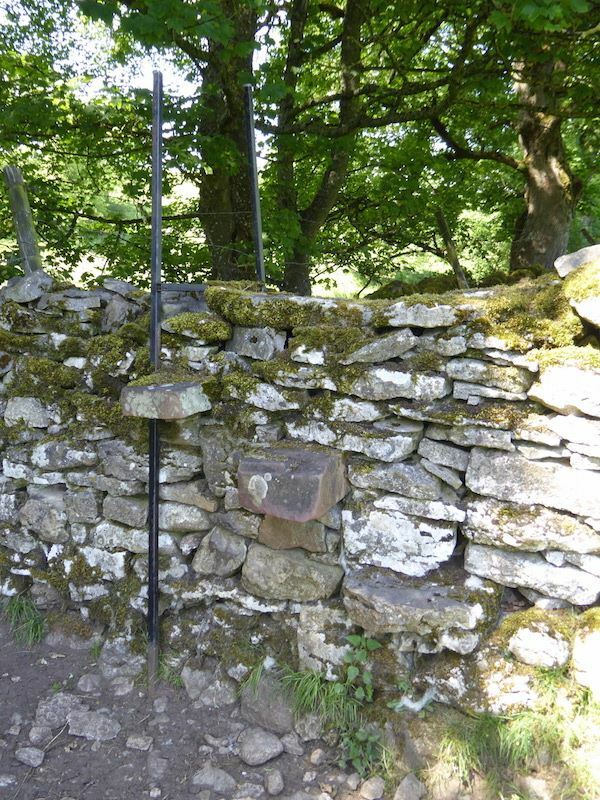 The signpost indicating that the track led over to Holme Bridge was lying in the long grass beside the gate, so maybe some of the proceeds from the lunch ‘do’ can go towards paying for it to be placed vertically once more. 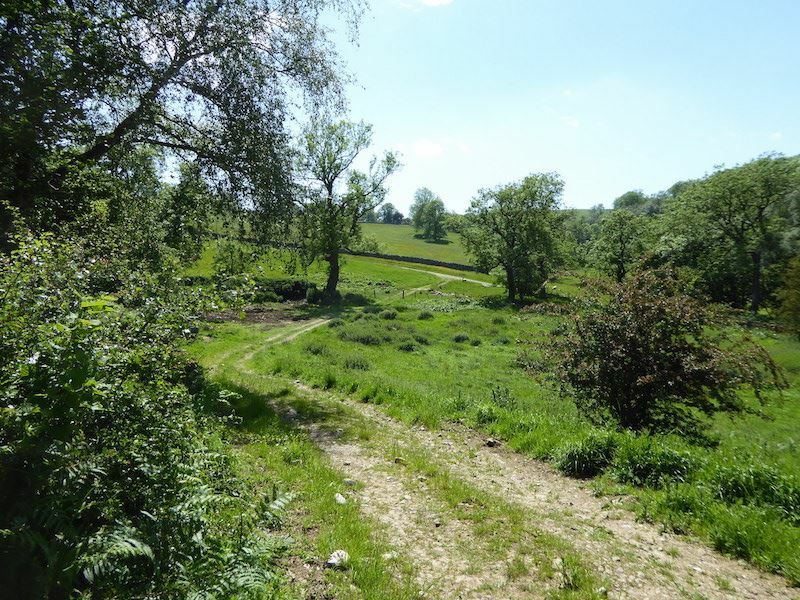 The initial stages of the walk take us alongside the Lyvennet Beck and through a number of fields, each one of which had to be exited by, what turned out to be, a rather large number of stiles. This is stile number one. 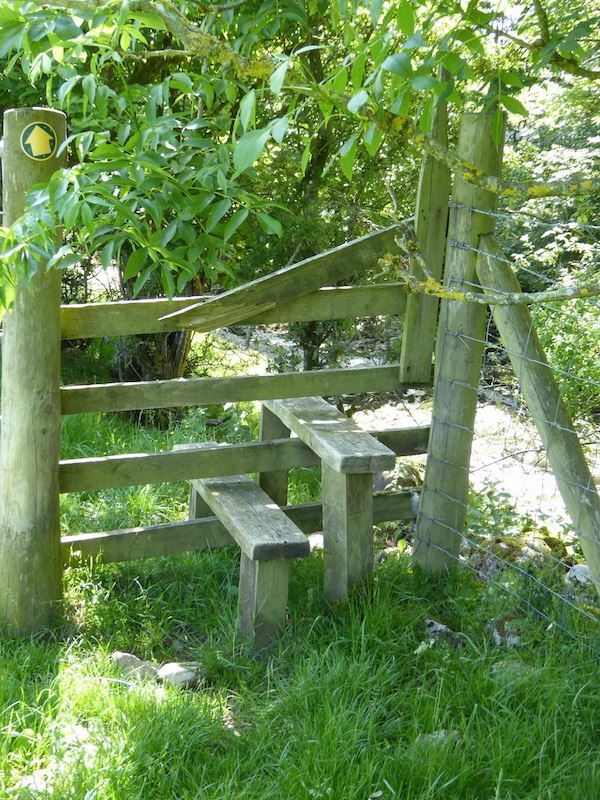 Walking alongside the beck and up ahead is stile number two. 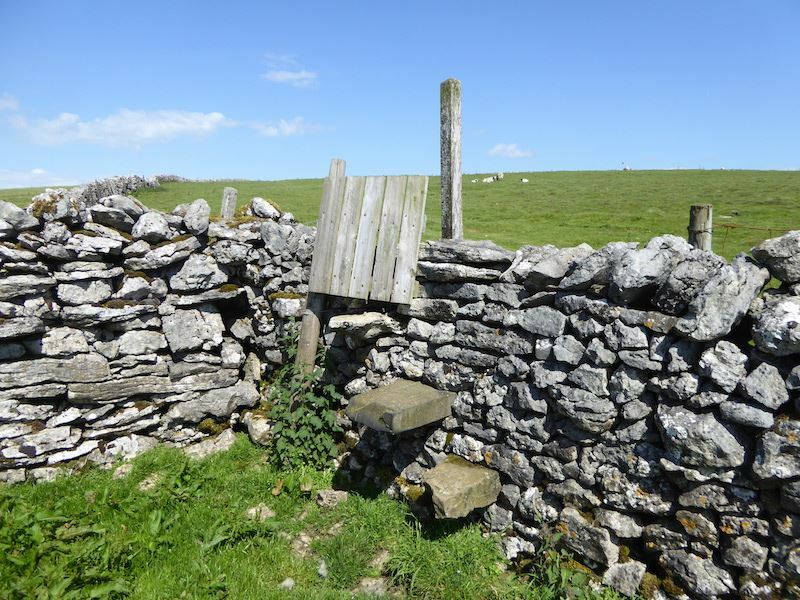 Stile number three, the path from which eventually leads us to …..
….. a short stretch of road walking along to Holme Bridge …..
….. where, at the end of the bridge, we have to squeeze ourselves through this very narrow gap in the wall. 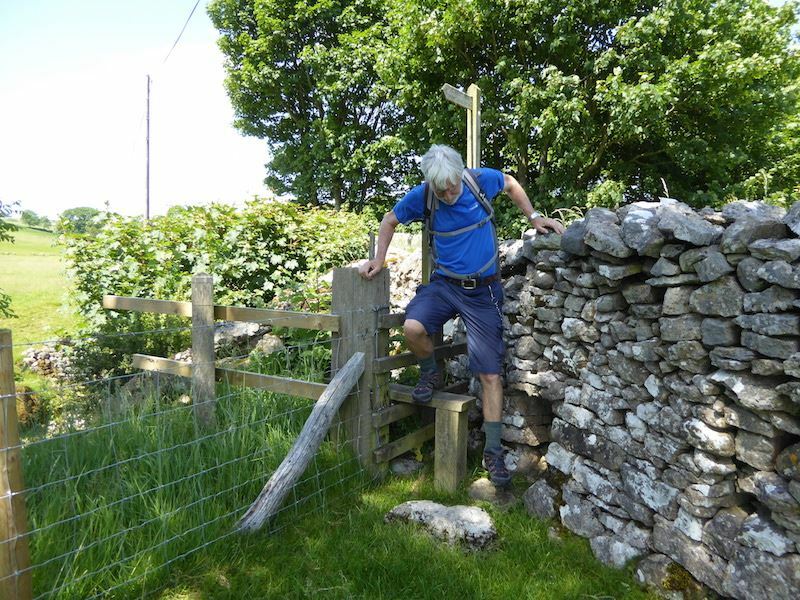 Once through the gap its a very sharp turn to the left where we find …..
….. stile number four, which was a bit awkward to negotiate as it was wedged tight up against the wall corner. Gently does it onto the not quite mended foot! 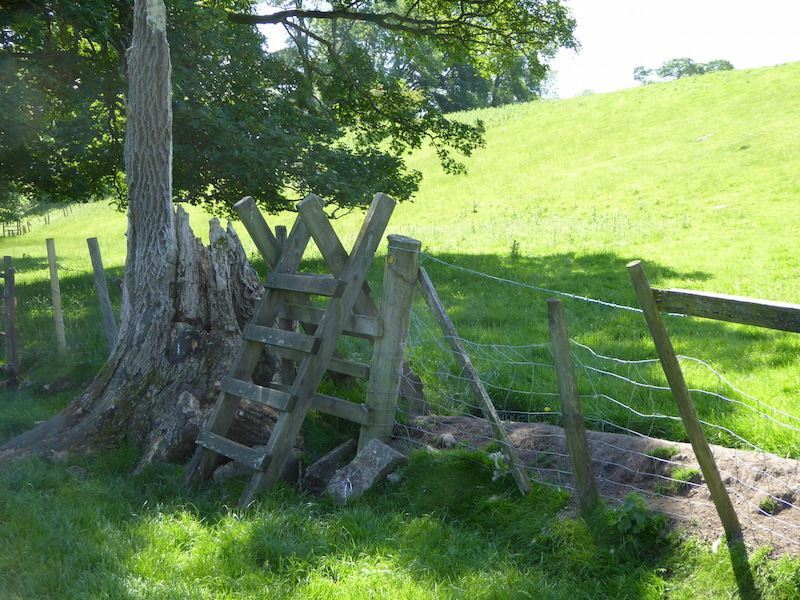 On we go across more fields to make our acquaintance with stile number five …..
….. and on across the next field to stile number six, and on to …..
….. stile number seven, we’re getting good at stiles now! Once over the stile we find ourselves in a lovely buttercup meadow and I’m immediately taken back to my childhood. 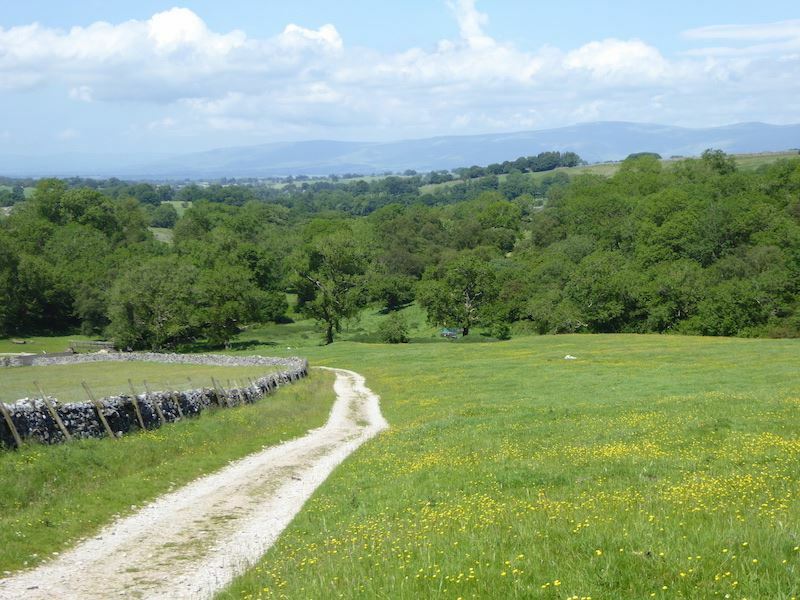 The fields around the Yorkshire village where I was born were exactly like this and I spent many happy times running around them with my playmates, making daisy chains, sticking buttercups under our chins to see if we liked butter and playing roly-poly down any little slope we could find. A huge wave of nostalgia washing over me as I gazed around. Happy days. 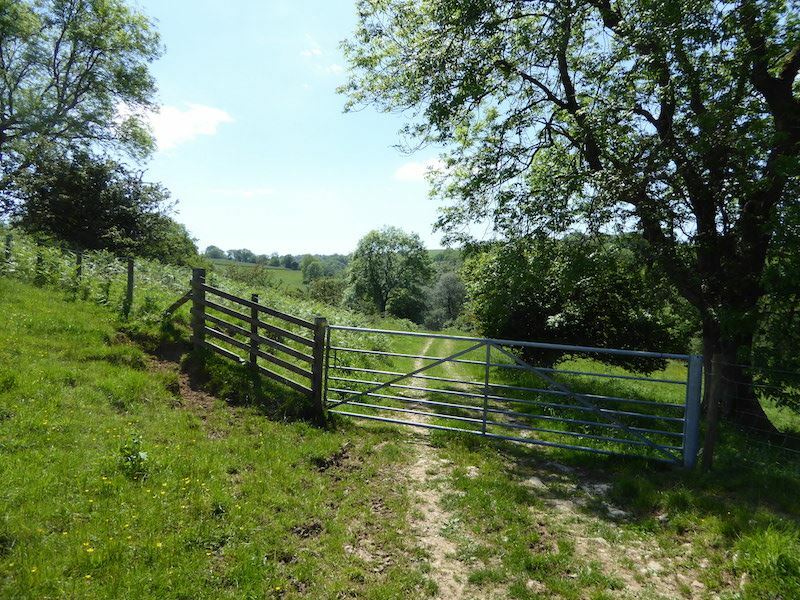 We leave the buttercup meadow and pass through the gate and follow the old farm track for just a short way …..
….. and at the end of the track we take a left turn at the T-junction over there and begin to follow a much wider pathway. 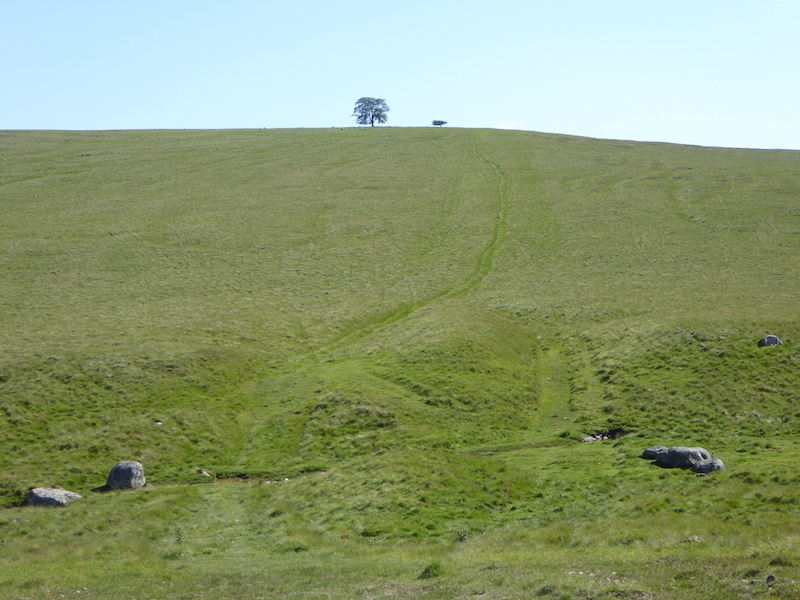 A look back from the wider, and steadily climbing, pathway which wends its way through another buttercup meadow. 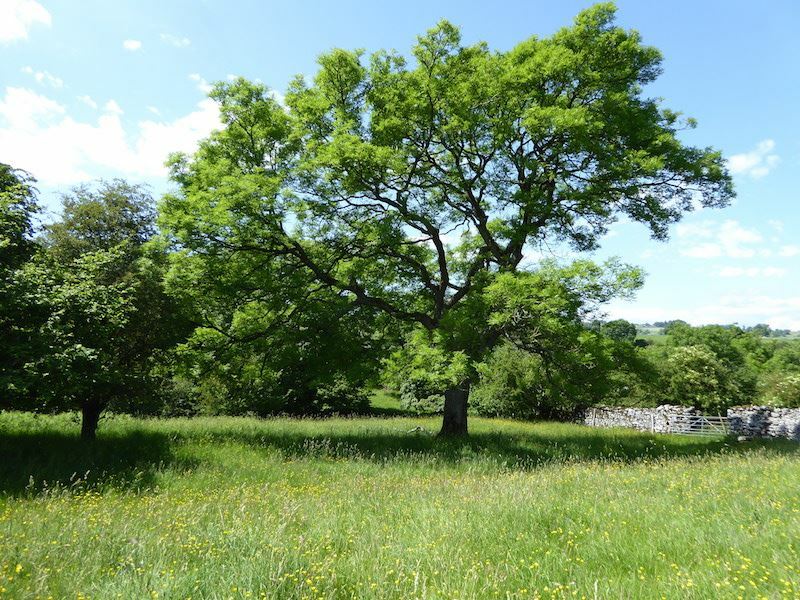 The number of these meadows has declined over the years thanks largely to modern farming practices, which is understandable but a huge shame. They are a great delight and its a pleasure to walk through them and to see the bees and butterflies busying themselves amongst flowers. For me it encapsulates what an English summer is all about. Almost at the top of the incline and we pass this old barn beside the pathway. Its now 2.30 pm, the sun is high and hot and we decided to take advantage of some nearby rocks and sit for a minute or two and take some liquid on board. Our view across the gentle countryside as we sit in the shade, enjoy our drinks and the view, and generally cool down a little. Suitably refreshed after our short break we return to the pathway for just a few short steps and then take a right turn over stile number eight. 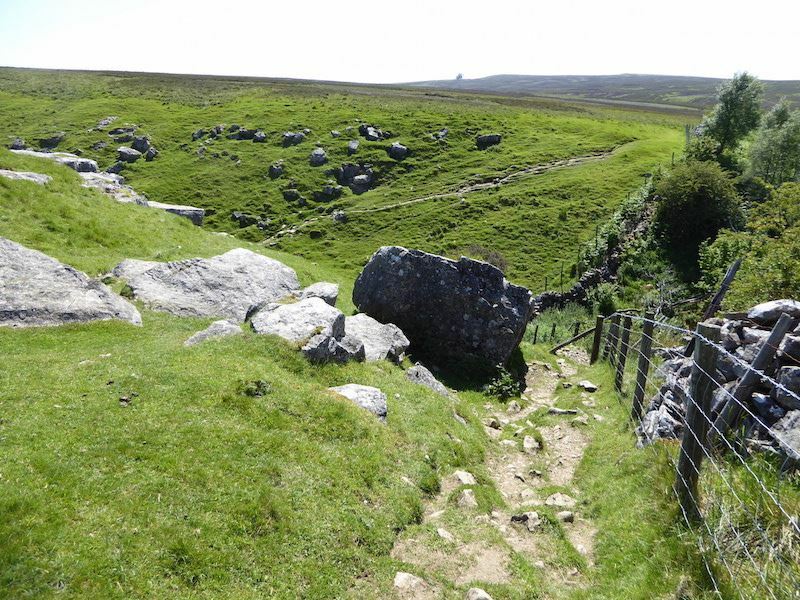 Once over the stile, and through two gates, which followed each other in quick succession, we were out onto this new track. 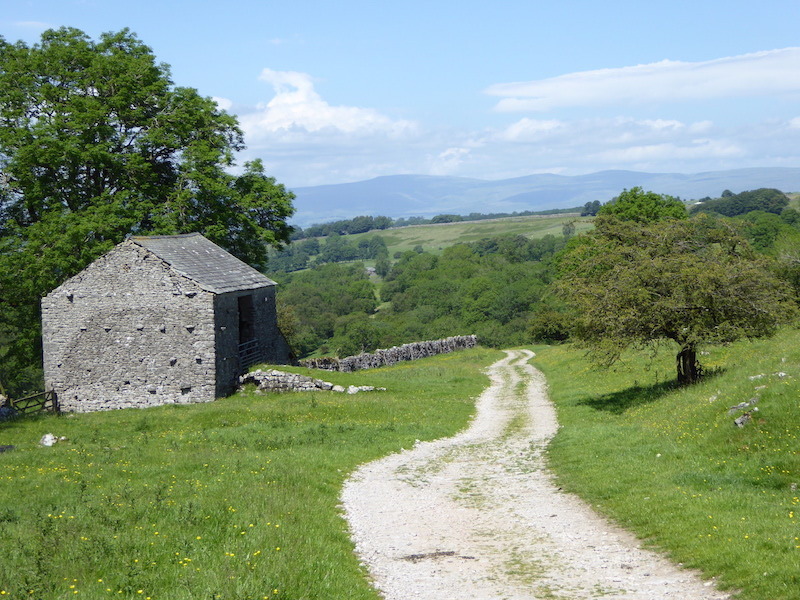 The stile and two gates formed a little dog leg which enabled walkers to skirt around Crosby Lodge, the building in the picture. 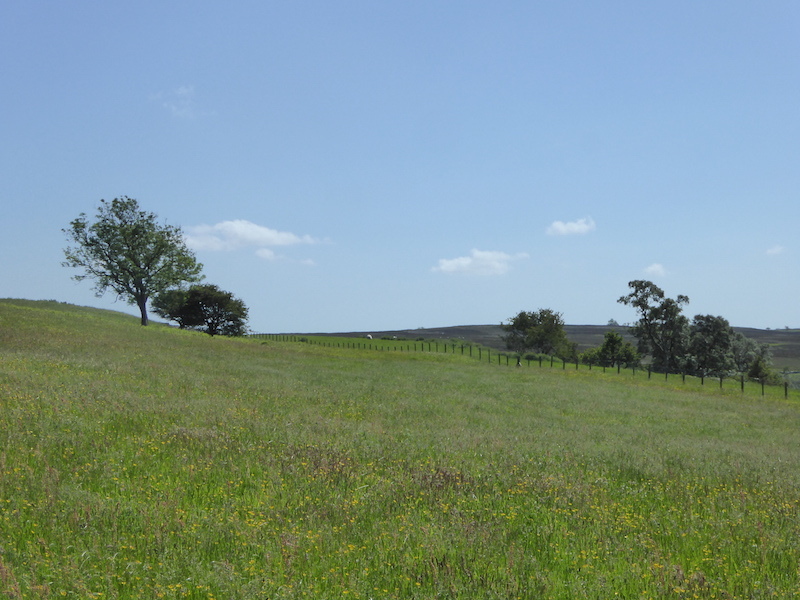 We followed the new track for a good distance but, once through the gate in the centre of the shot, the track came to an end and we had a pathless walk across a large swathe of meadowland. The dark green patches in the grass being the tracks we have made in it up to this point. 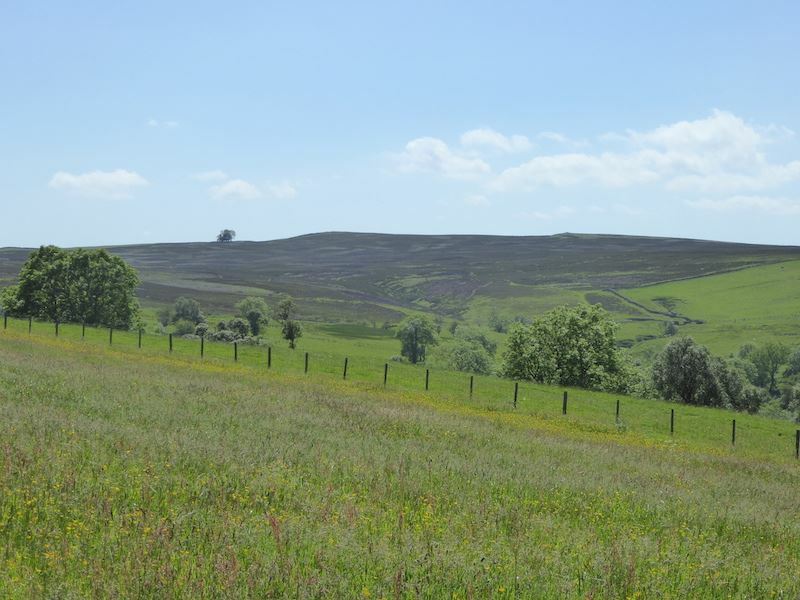 We’re still ploughing our way through the meadow flowers and long grasses and climbing steadily and eventually, over to our right, the heather clad fell sides come into view. 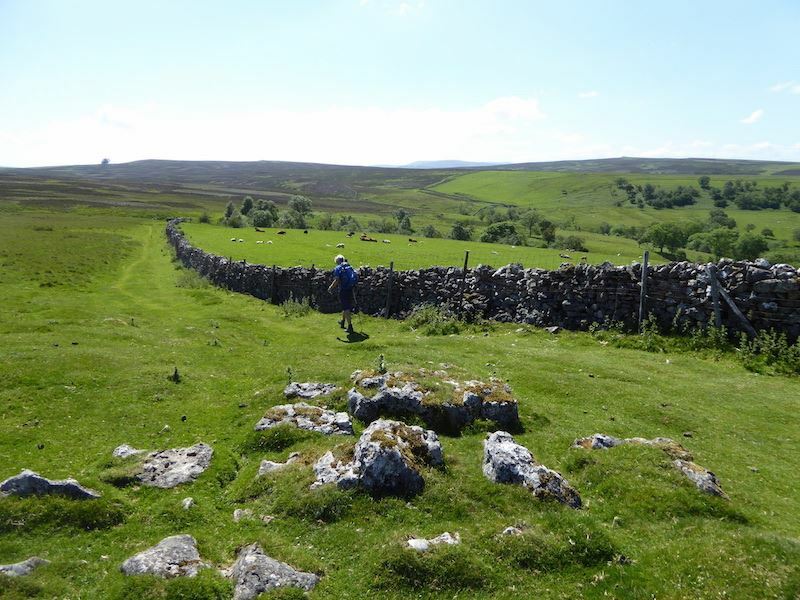 We’re still climbing but are nearing the end of the meadowland, The fence over on the right eventually meets a stone wall, and we cross the fence by means of a metal gate. 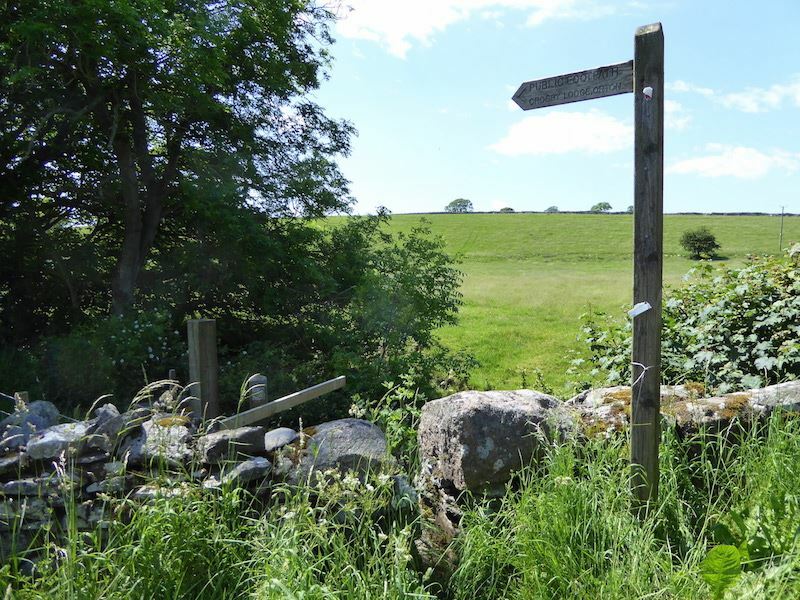 Once through the gate its an immediate left turn where we find …..
….. we need to cross the stone wall using stile number nine, a step stile with a small hinged gate at the top of it, and a huge patch of nettles on the other side just waiting for anyone who should have gone to Specsavers! 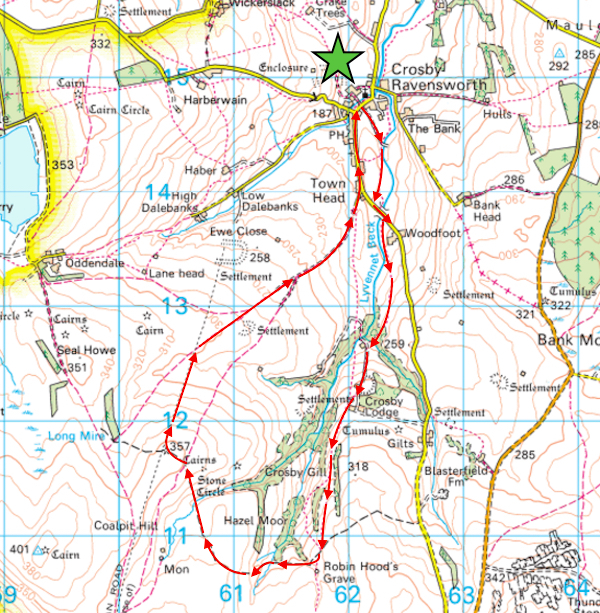 We escaped without being stung, there’s nothing worse than a nettle sting nagging away at your legs for the rest of the walk. 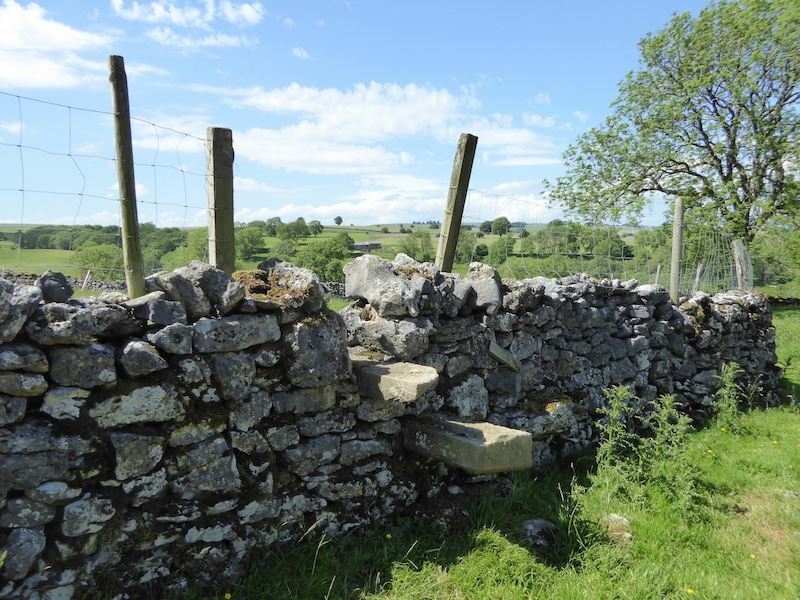 Once across the stile and we are out onto the moorland where its just a case of following the wall which we’re quite good at, having had lots of practice in the art of wall following over in the Lakes. I would even go so far as to say we have reached Olympic standard in wall following. 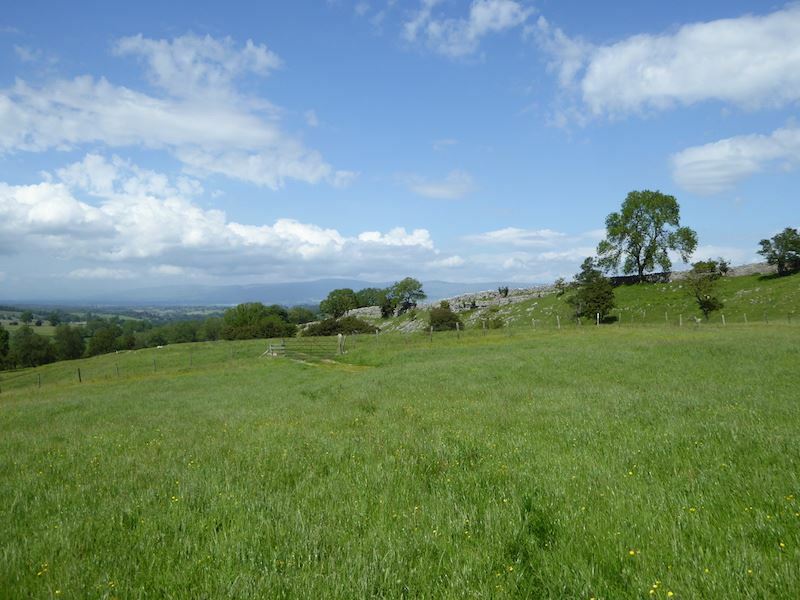 Wide open spaces all around us and just a couple of miles or so to the west of us, but not in the shot, is Great Asby Scar which we visited recently so we’re well into limestone country now as well as heathery moorland. 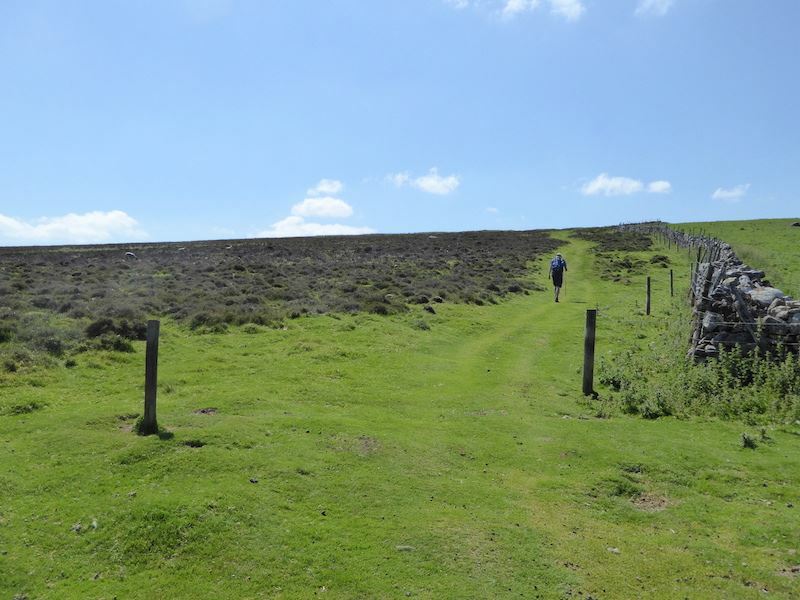 Down the steep dip we go …..
….. and then have to climb out the other side. 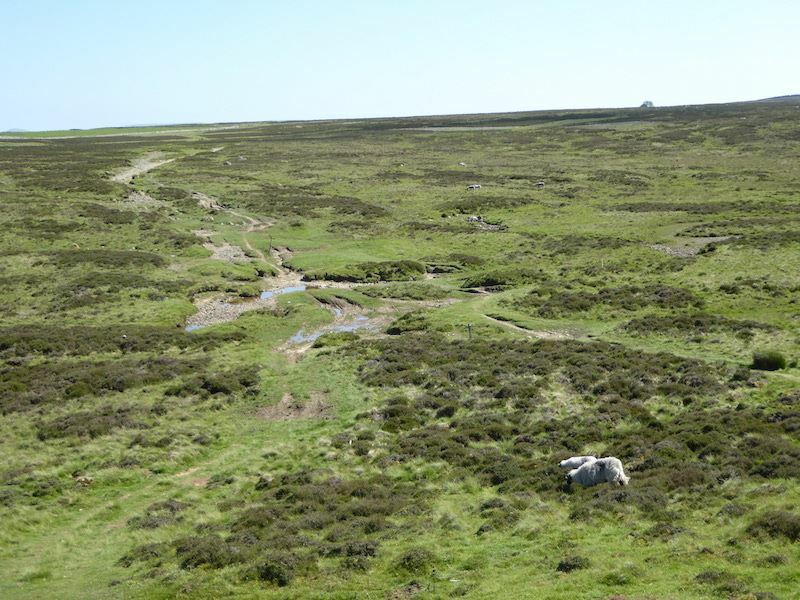 There’s no beck down there its just down to the how the land lies. Down another dip, where there is the tiniest of becks amounting to very little more than a tap left dribbling, and then onto the path on the opposite side which starts to swing away across to the left. 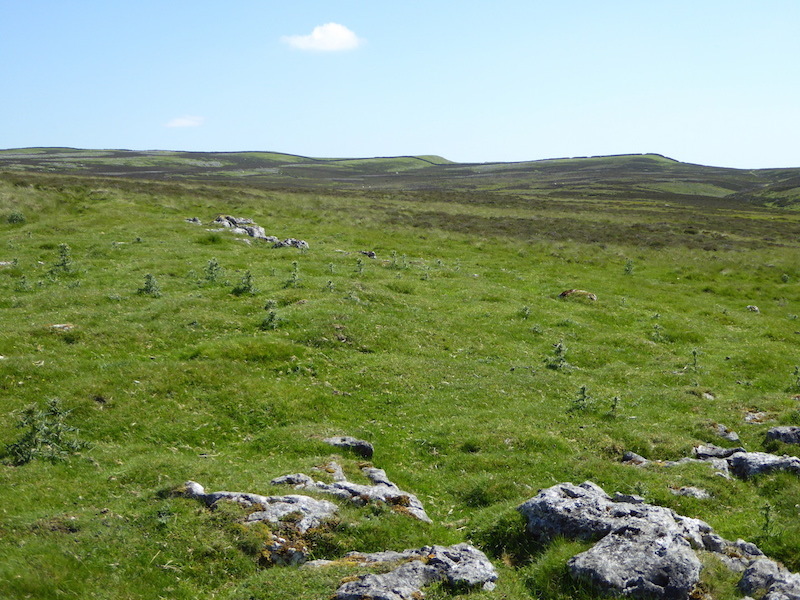 Beyond the beck and we begin to walk on the lovely springy turf over the open moorland. 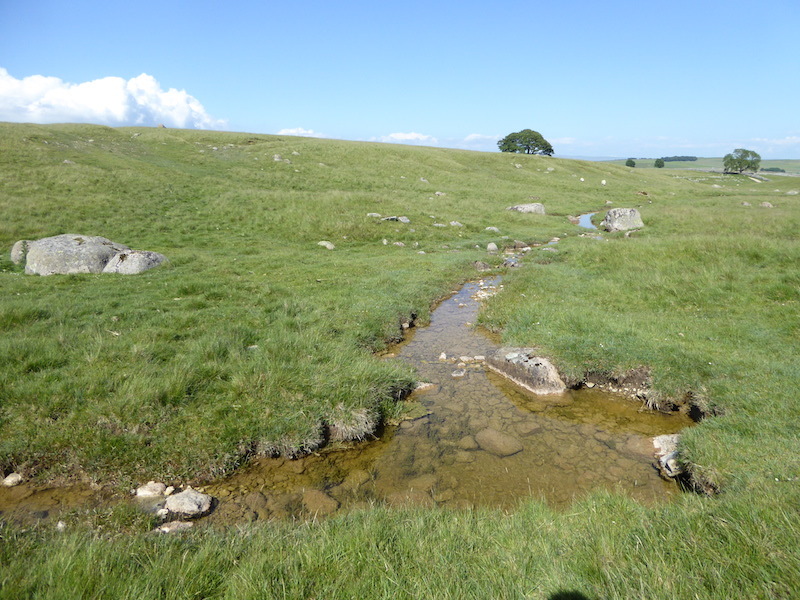 I took a look back towards the beck crossing before making my way up the moorland path. 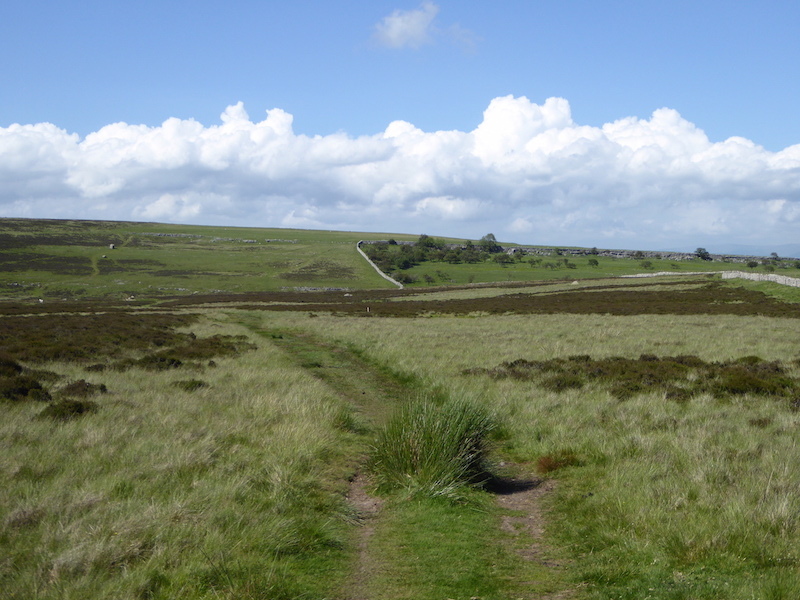 Having climbed out of the valley we now have the benefit of the lovely breeze sweeping across the moors, not at all cold and wonderfully cooling. 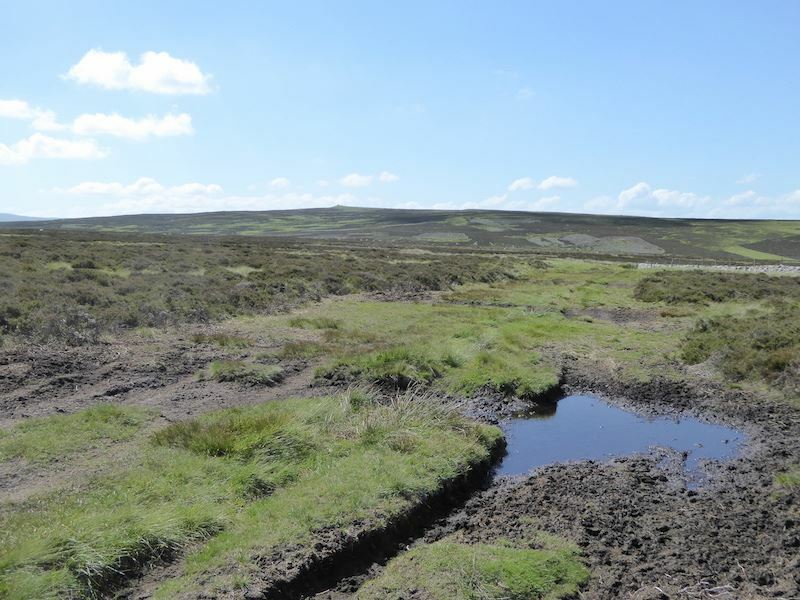 As with all moorland the route across is largely featureless and, with the exception of one or two remaining puddles here and there, bone dry thanks to the last few days of sunshine. No bog hopping today, which is fine by me. The way ahead, to the next dip in the land, with its undulating and dry paths providing a very enjoyable tramp across, it was just grand to be out on such a lovely day. 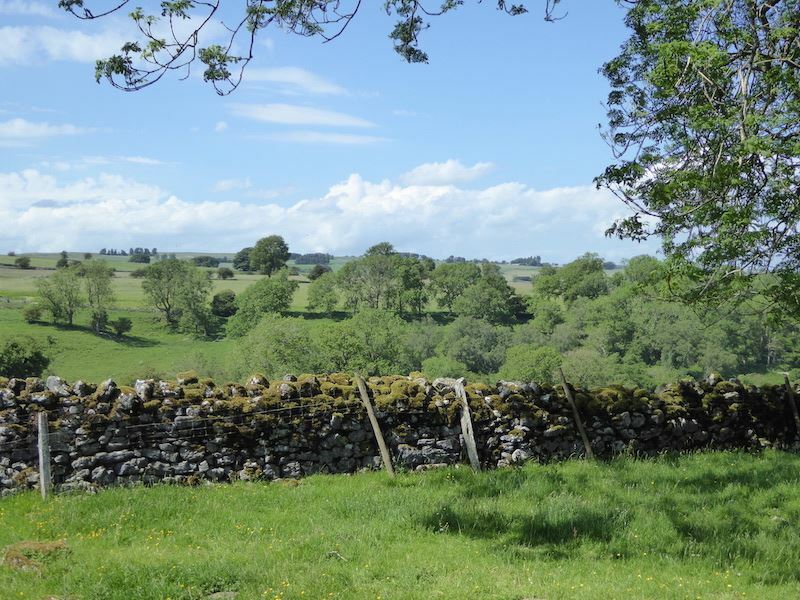 Sunshine, blue skies, fluffy white clouds, and a lovely cooling breeze – what better weather could a walker wish to have? 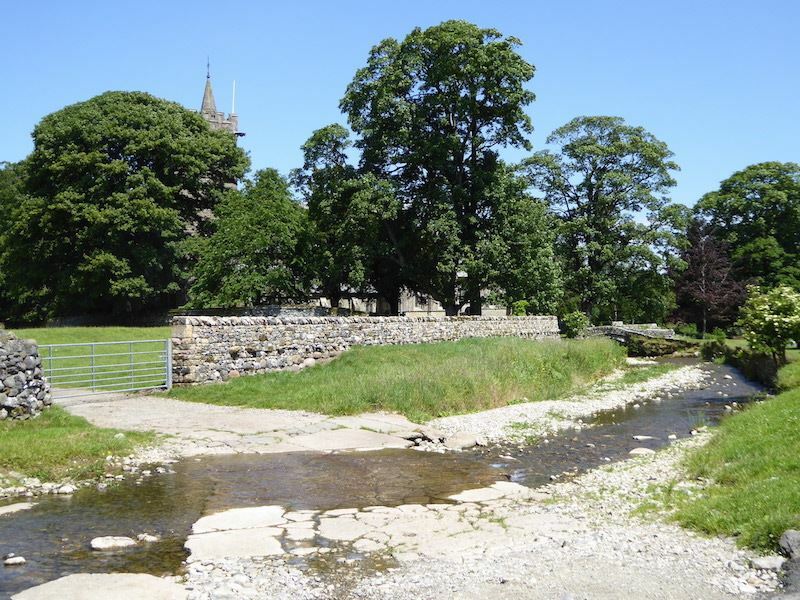 At the next dip we reach the infant River Lyvennet. I know it only looks like a puddle from this angle but the water was flowing in from the left, just behind that grassy step in the bottom left, and continuing along, on the right, on its way down to the village. 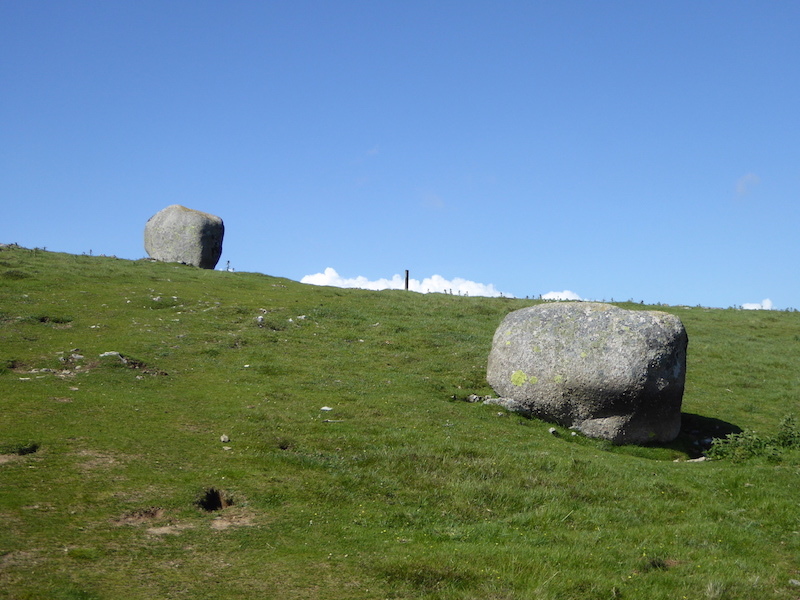 Towards the right skyline are two large erratics, leftovers from the ice age. A look back at the infant river as we climb towards the erratics. 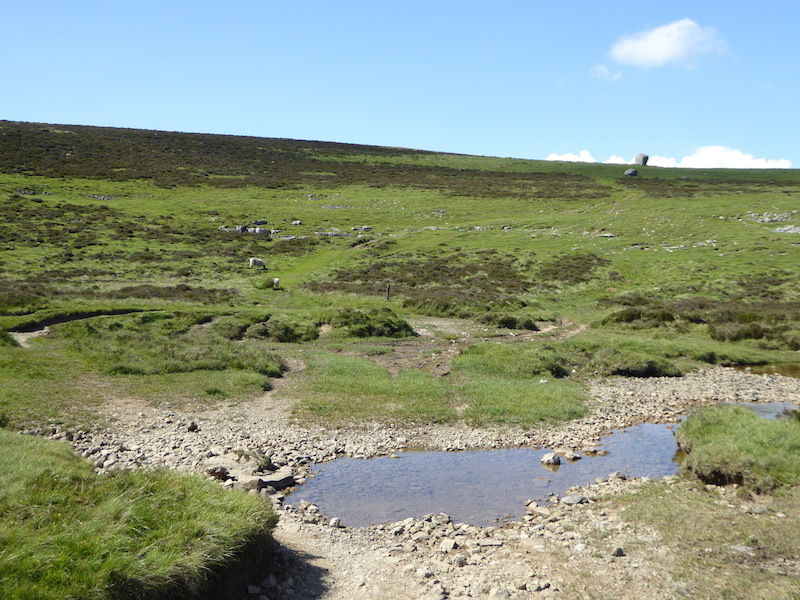 The source of the river is just about one third of a mile away, over to the right of the shot. 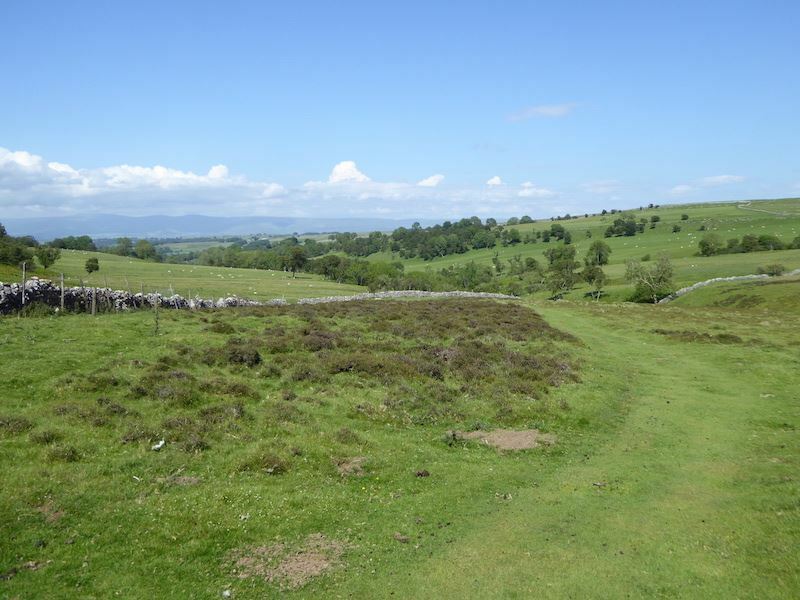 There’s a monument at the source marking the spot where King Charles II rested with his army in August 1651 when marching from Scotland following his coronation in Scone on 1st. January. We didn’t bother going over to look at it, after all it was only a drinks/refreshment stop for them, not the scene of a great battle, so why does it have a monument? If someone put up a monument every time we, and other walkers, stopped for a drink the Lake District fells would be littered with the things. 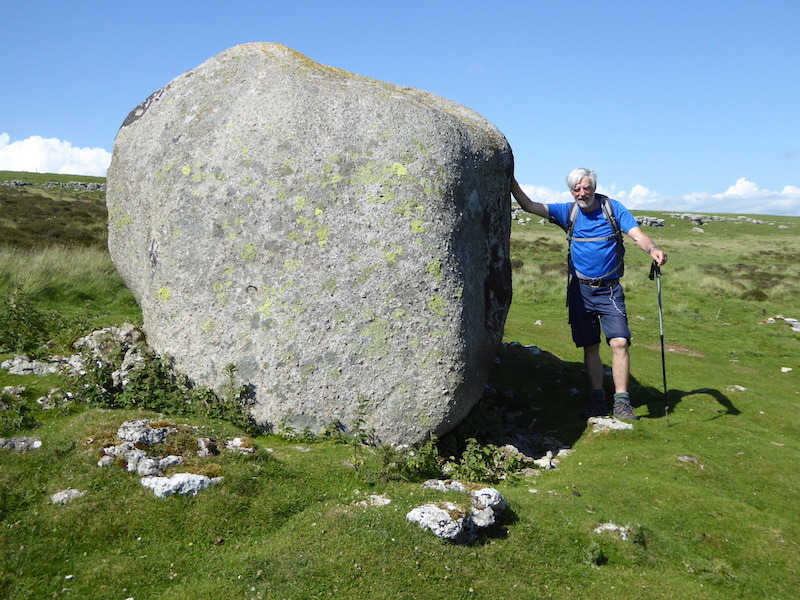 Walking up the hill from the beck and we reach the two erratics …..
where J stands beside one to give an idea of how large they are, Go on then, give it a shove! 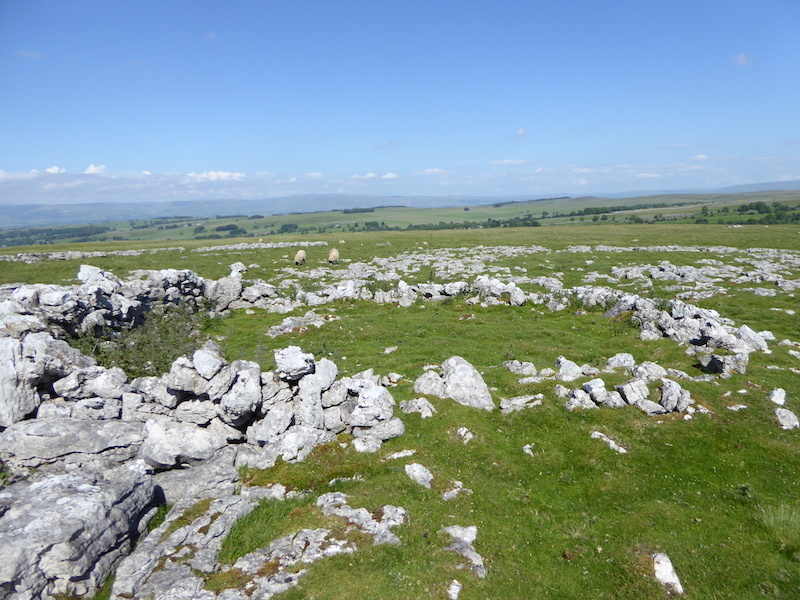 Just beyond the erratics and the limestone pavements begin to appear …..
….. and amongst the pavement an ancient stone circle. 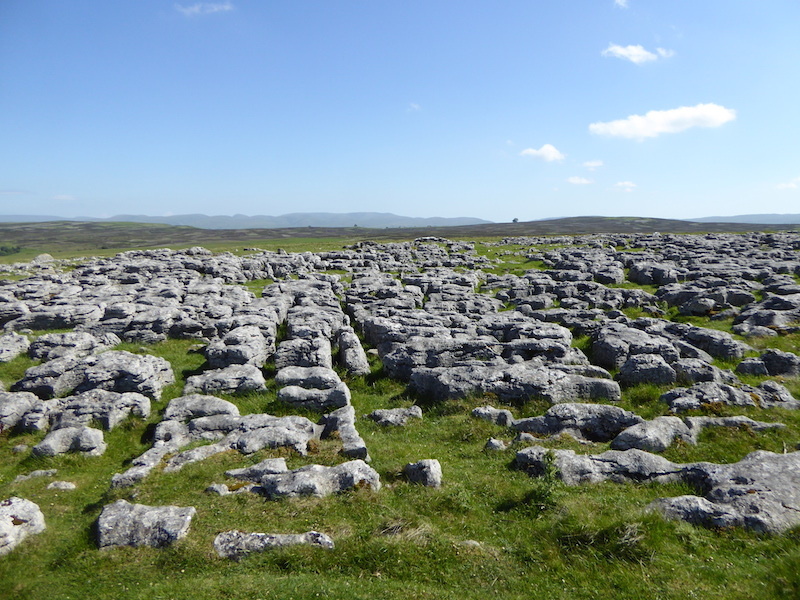 The grikes and clints on the limestone pavement. The pavement isn’t very wide from east to west but covers quite a long distance along its north/south axis. 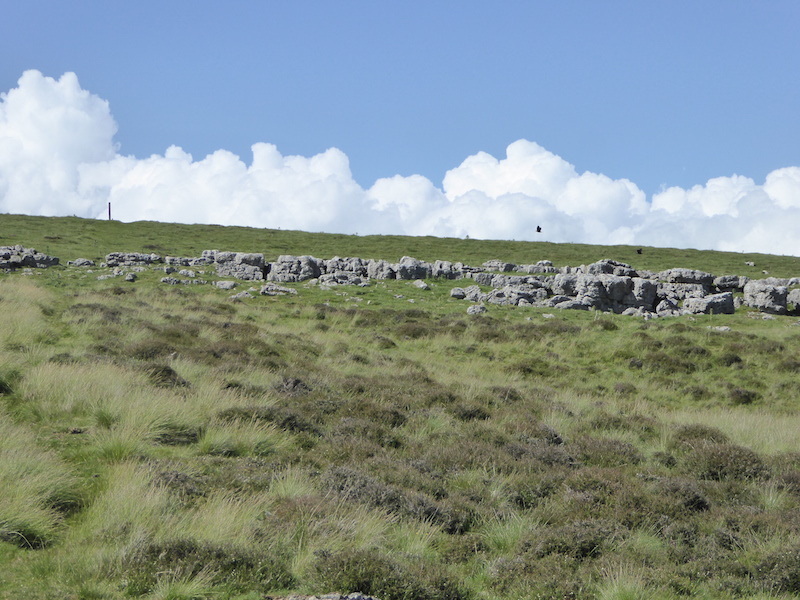 We only stepped just a few paces to the west and we were back on grassland again, but behind us to the south. it seemed to go on forever. 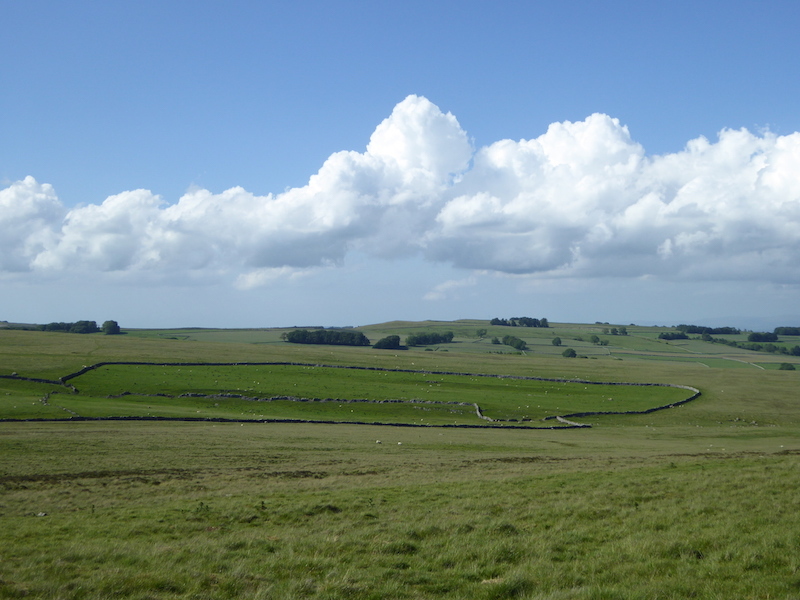 Clouds building in the afternoon heat and its getting hazier over the north Pennines. 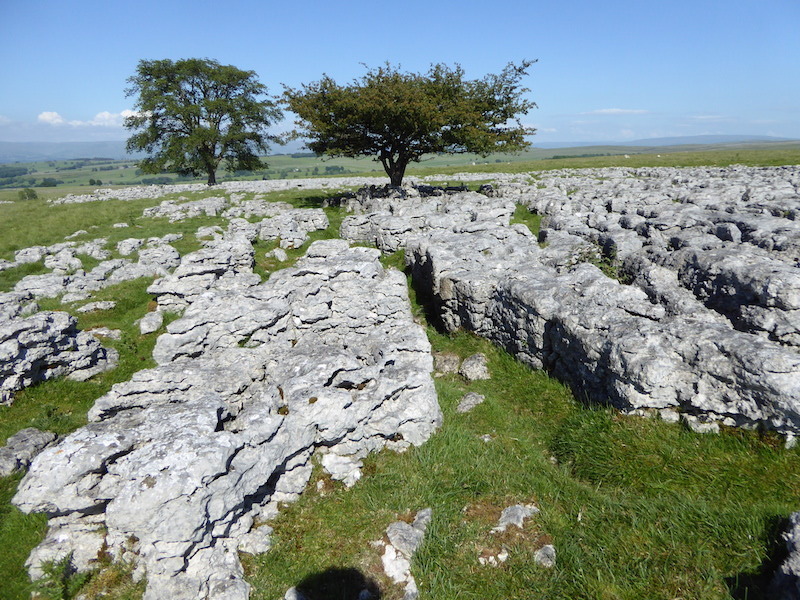 A couple of trees flourishing amongst the limestone …..
…. 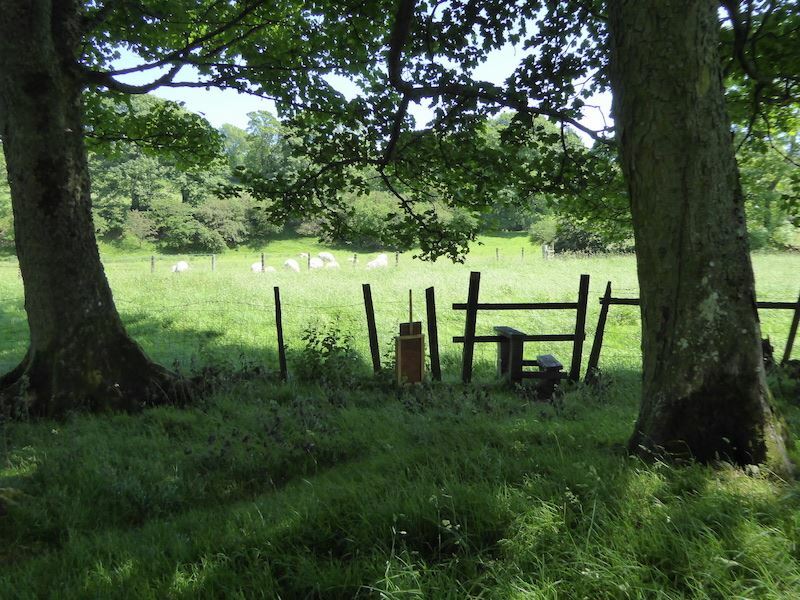 and a field enclosure just to the west of them. 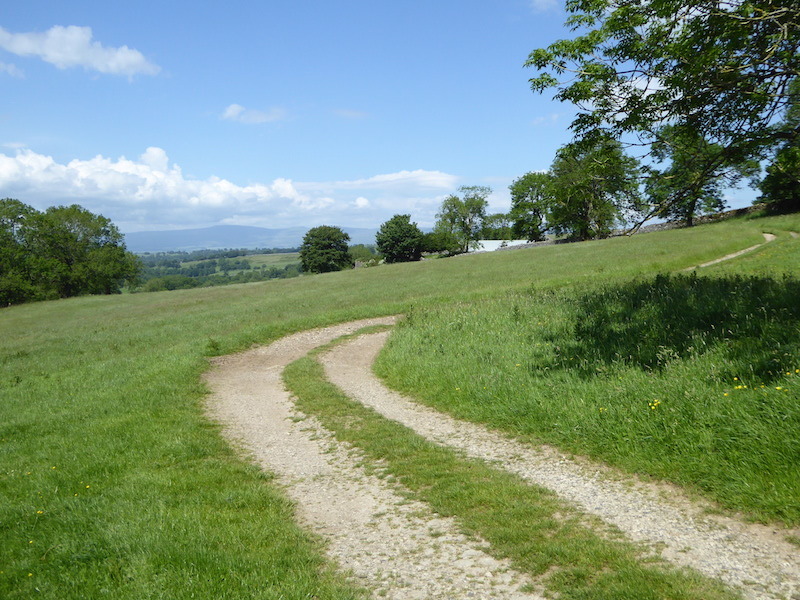 The path we will follow next runs north/south between the trees and the enclosure and follows the line of an old Roman road, Wicker Street, which connected the fort at Low Borrow Bridge in Lunesdale, with either Brougham, near Penrith or Kirby Thore, near Appleby. 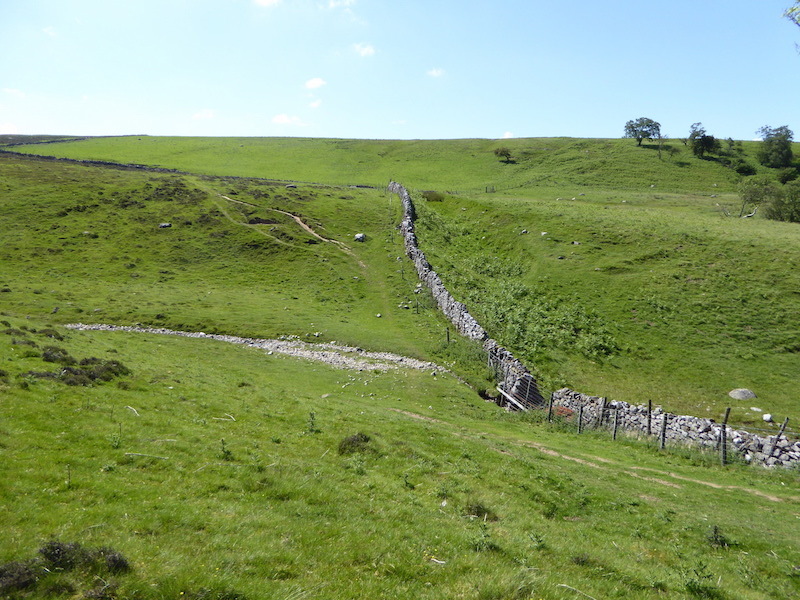 Another small beck to cross, then its up the slope and …..
….. then a look back at the long tramp down from the two trees at the limestone pavement. 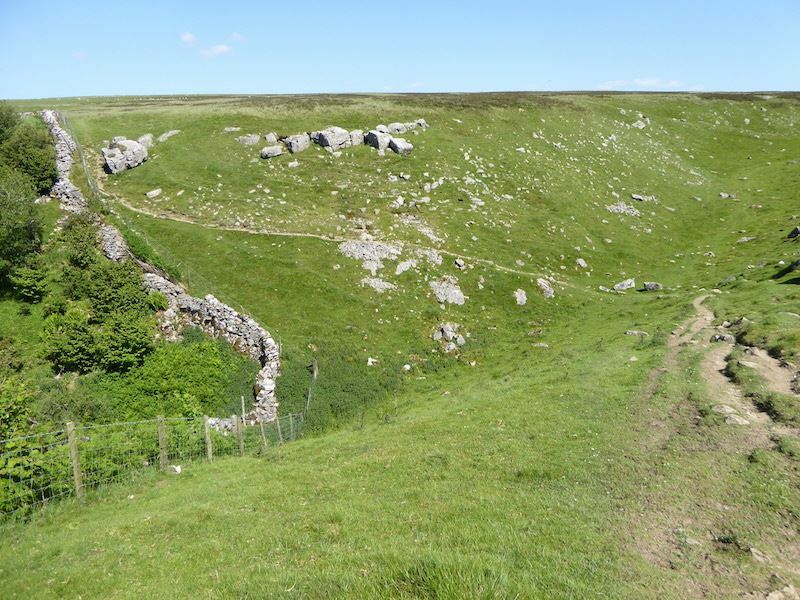 We keep going on the grassy path which eventually morphs into this surfaced track which funnels us through an increasingly narrowing strip of access land, with the intriguing name of Slack Randy. 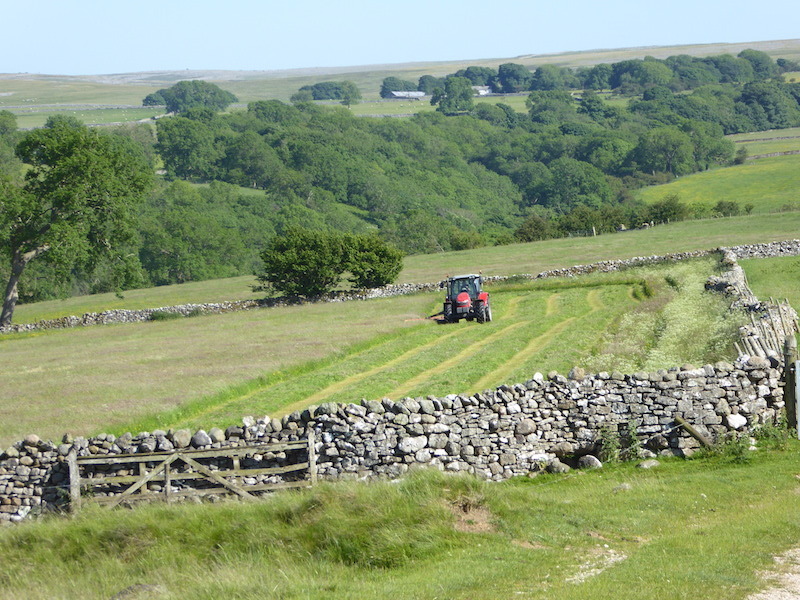 The sound of an engine and the unmistakeable scent of freshly cut grass came drifting across with the breeze so I waited, and out of the dip below me appeared the farmer doing what many farmers do at this time of the year. Eventually the roughly surfaced track gives way to tarmac and we are almost back at the village. 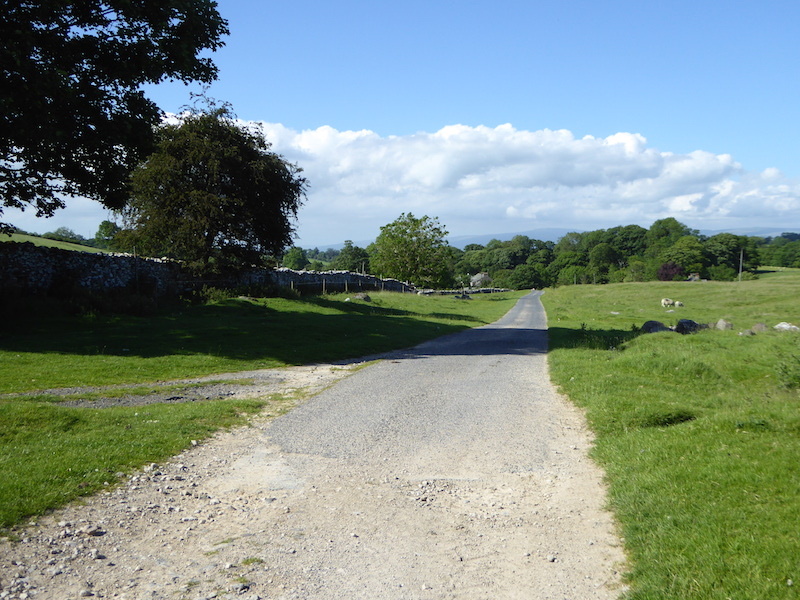 At Town Head the lane we have just walked, on the right, joins the motor road of Gilts Lane and we begin our walk back into the village. 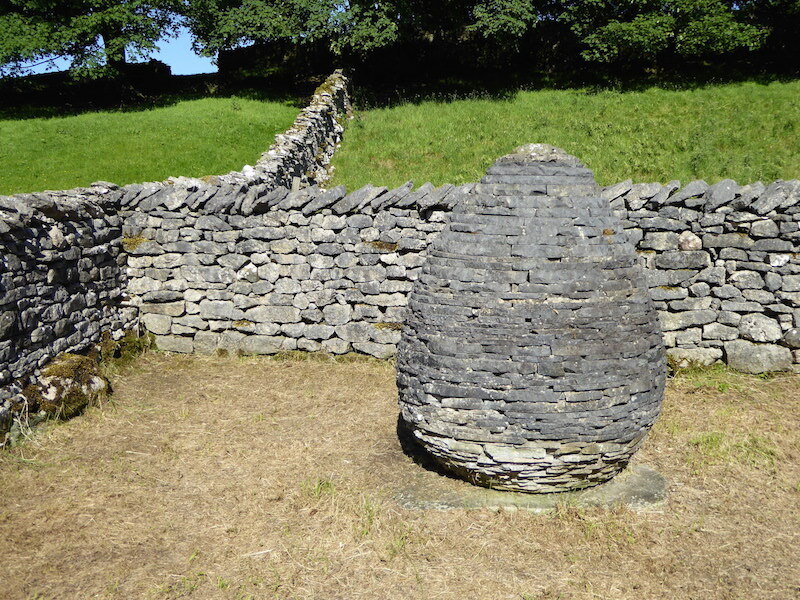 Right next door to a cottage named Well Head was this very small grassy area with this stone cairn-like sculpture atop an old stone slab. 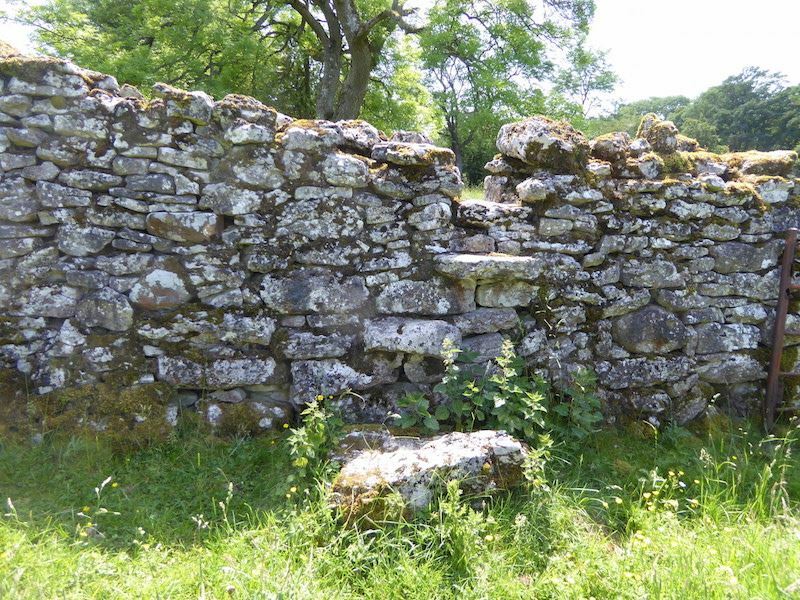 Was there once a village well below that old stone slab we wondered? We pass by Jennywell Hall, a Grade II listed building in the village, but we didn’t pass by a building just a little further down the lane, The Butcher’s Arms, where we partook of a little light refreshment in the form of half a pint of bitter, for him, and a bitter lemon, for her. When I asked why we needed to buy drinks when we still had loads of fruit juice and water left in the pack the response was “Yes but this hits the spot better”. 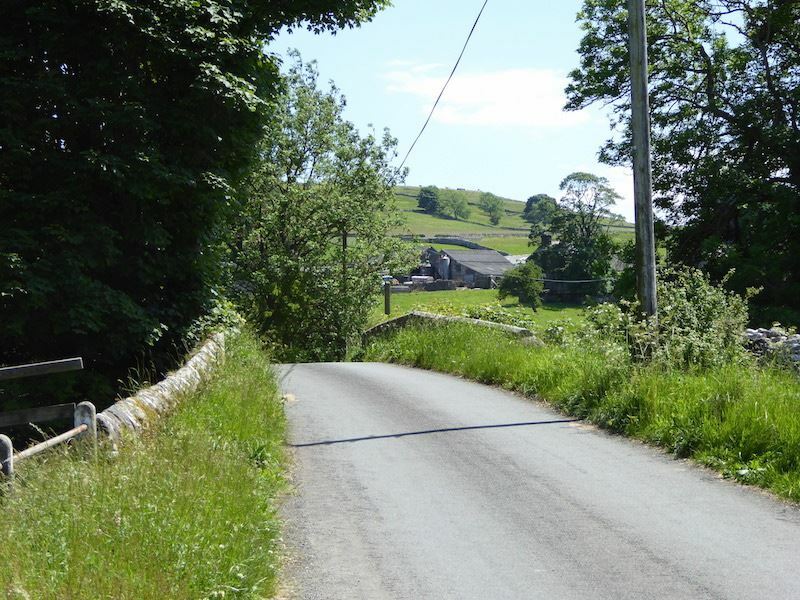 Down the hill and round the bend from the pub and we are back at Crosby Ravensworth village hall. 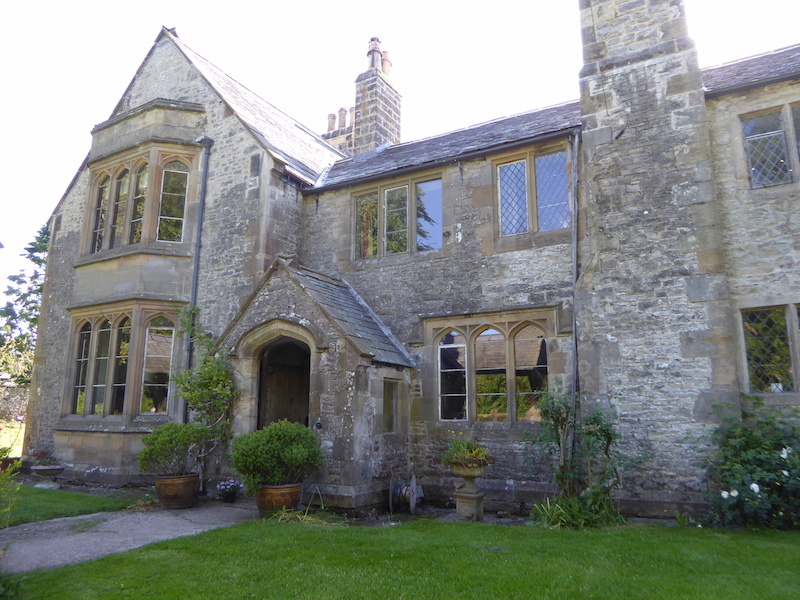 The luncheon guests have all gone home, the hall is locked up and ours is the only car left parked in the village. So we walk the last few yards along to the left, climb in, flop on the seats and say how much we have enjoyed this walk. 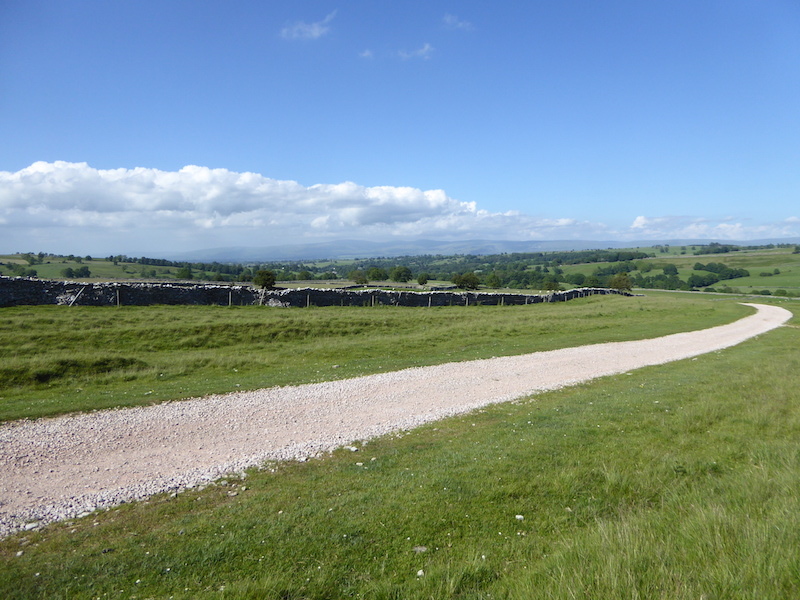 Its had a little bit of everything, plus that large number of stiles, and it was an absolutely beautiful day in which to do it. So we did and really enjoyed those too. Its the simplest things in life which bring the most pleasure, isn’t it?